Mark Hampton, Jr., known as xxSTL2LAxx, is a professional gamer hailing from St. Louis, Missouri. He has been gaming since age 7 and began competitively competing at age 14. During his earlier years, Mark grew up playing football until middle school, where he shifted to playing basketball in high school. Being an avid gamer and basketball fan, NBA 2K was the perfect place for Mark to excel. After a successful Season 1 combine, Mark was selected by Bucks GG in the Fourth round of Season 1 NBA 2K League (59th Pick Overall). During Season 1’s combine, Mark qualified as a small-forward, where he was 5th in PPG and 4th in eFG%. During his first season, Mark was able to make his impact on both the offensive and defensive side of the ball. Showcasing his versatility, Mark played a variety of positions, including point guard, shooting guard, small forward, power forward, and center. One of his highlight games was his 30 point and 7 rebound effort versus playoff team, Wizards DG. After a successful season, ST2LA is ready for Season 2 and to make a lasting mark on the league and compete for a championship. Can you tell us a little about your background, how you got into competitive esports and the 2K League in particular? My name is Mark Hampton Jr and I born and raised in St. Louis, Missouri. I am the youngest of 5 children. I grew up playing multiple sports, including football , basketball, and baseball. I’ve played organized sports almost my whole life and enjoyed being part of a team. Then around 5 or 5, I found out about gaming and the rest was history. I started gaming and I can still remember playing 007 on Nintendo 64 over at my grandparent’s house with my cousins on the weekends. At age 11 or 12, I really got into the 2K scene with NBA 2K10. This was when I really was starting to understand how the game should be played as I continued to play in real life ball. Once I graduated high school, I wasn’t sure of my exact path, so stayed in town and worked at a local retail store while I played countless hours of NBA 2K in both tournaments and leagues trying to win prizes and notoriety in the scene. In 2017, I got very involved in the competitive Pro-Am community and began playing for various teams until I eventually had my own. Once the NBA 2K League was announced, I always felt that I was one of the best players so I pushed myself even harder to make the first season of the league. After the first season, I realized that playing 2K competitively was what I wanted to do with my life and that I strive to be one the the greatest to have touched the controller. How was the Season 1 experience with Bucks Gaming and the NBA 2K League, and what were some of the more memorable experiences you had? 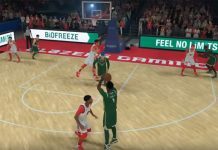 Season 1 of the NBA 2K League with Bucks Gaming was exciting and it was like nothing that I could’ve expected. I know we didn’t complete the ultimate goal, winning a league championship; but, when I look back at it, it was an amazing experience. Everything from building friendships from people that you only get to know for 6 months to becoming one unit and all of the travel and live competition experiences. I can proudly say I enjoyed my time in Milwaukee and kind of wish things went different as far as the season went. However, as far as the organization and players, I have nothing but love and respect for them. The team personnel made it feel like a home away from home and I helped feel comfortable in a totally new environment. A special thanks to Colin, Andrew and Cayle, for a wonderful season that I will never forget. One of the most memorable experience, while I have so many; but, I’d have to say the pranks on Big Meek and jokes with Game6drake. The most memorable playing experience was our first round upset of 76ers GC in a tournament. I didn’t get to play against them in the regular season and everybody was expecting us to just lose that first round; and, we proved everyone wrong and won. When you’re not playing 2K, what are some of your hobbies or other games you play? What archetype(s) are you rockin’ with in NBA 2K19 and which archetype(s) did you choose for Season 2 of the NBA 2K League Combine? For 2k19, I make a second account with almost every build that will most likely be ran in the league, from Playsharps to Pure Glass. I spent this off-season practicing each position to be able to competently run positions 1-5. This way I could play what ever the team needs with the same skill and knowledge necessary to successfully run each position to perfection. In this past Combine, I completed over 200 games at a variety of positions. Last year, I only played SF and PG in the combine; but, this year I wanted to prepared so I played every position. At the PG spot, I went with a mix of Sharp-Play and Play-Sharp; at SG, I went pure sharp; and, at SF, I went with pure lock. I love the defense in this year’s game so I think that pure locks can dominate a game and be game-changers in Season 1. For PF, I went with athletic sharp, as PF is also an important position this year, as you are the center’s backbone and help. Finally at center, I went with a mix of ure glass, sharp rebounder, and a pure rim to really test the differences from last season for myself. After getting drafted by Bucks Gaming, relocating to a new city with new teammates, being a pro player, being in the draft pool for Season 2 and prepping for another season – what has that whole journey and process been like for you? This whole journey has being amazing and a blessing as there are so many people who that wanted to be in Season 1 and for me to be recognized as one of the top players in Season 1 is amazing. I just want to thank the NBA2K League and Bucks GG for giving me an opportunity to represent them in the best way! What would you ultimately like to accomplish in the league? 1. Win an NBA2K League Championship, which should be everyone’s #1 goal as you can’t be considered the best without wining at the highest level. 2.To help grow myself and the league to become a bigger force in the esports world. I know this League will blow up bigger than people think, it just takes some time and consistency. 3. To be one of the best role models I can be on and off the court! I credit to LeBron, as he is a perfect example of what a role model should be on and off court. Along with 2K, you play basketball in real life – how has that helped you to translate your game to the virtual court, and what’s your play style on the real court? Playing ball in real life I think has helped me a lot because I’m used to doing everything on the court so no matter the position I can do a little extra to help the team and understand how the game should be played. How would you describe yourself as a teammate and your play style, and which NBA player (current or past) would you compare your game to? I would describe myself as an understating hardworking teammate. During practice I like to get what I can out of it so if I prepared for the stage. My favorite player is Kobe Bryant (hence STL2LA); but, as I got older, I started enjoying playing the game and getting my teammates more involved, so LeBron James became my new favorite. This is because he plays the game the correct way and he doesn’t care if he’s the man or if he hits the game winner or scores the most, he is just always focused on winning and going to make the right basketball play! Do you have any advice for up and coming NBA 2K League hopefuls on skills and qualities they should be working on to prepare for the NBA 2K League? My advice for 2kleague hopefuls is keep working hard on your skill-set; but, most importantly focus on your weaknesses. No one is perfect; but, if you can began to realize some what you need to improve on and focus on that, you’ll become a better player than you are now. I know am not perfect and I make mistakes; but, I will work on them as hard as I could. You should also make sure that this is what you wanna do with you’re life and just don’t do it for the money I got in the 2K League because I love the 2K game and I’ve always loved basketball. When I realized I was able to combine my two loves and that I was one of the best,I knew the league was right for me. A big thanks to Mark for doing the interview, and be sure to follow him on social media!